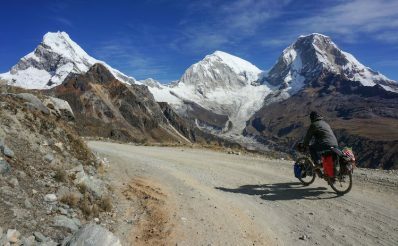 The Huascaran Circuit is considered by many as one of the best bicycle touring routes in the world and it has been on my list for years. Finally the time has arrived and here we are. After more than a month in Huaraz we were ready to take on the “big route” of the Peruvian Andes. We had spent the last month acclimatising and preparing for this demanding high altitude route. We hiked the Santa Cruz Trek, went ice climbing in Llaca, explore the many quebradas around Huaraz and cycled el Cañón del Pato. 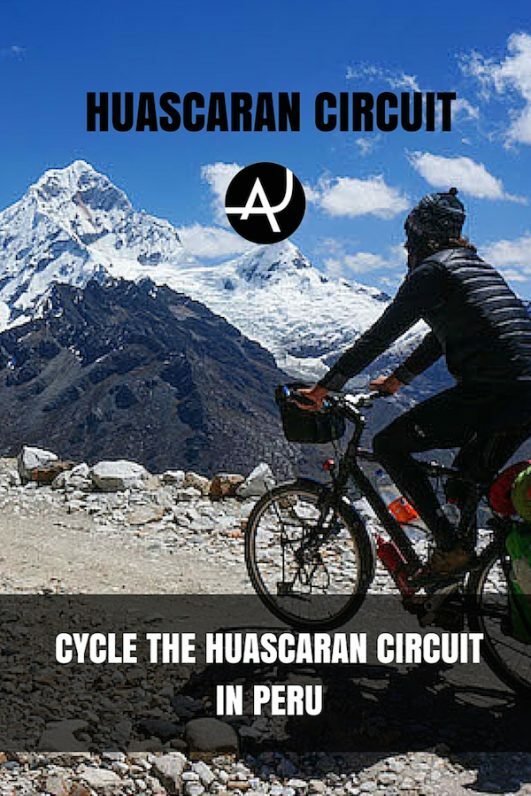 Everything was done with a purpose: to get ready to cycle the Huascaran Circuit. Our friend Pablo had arrived from Spain a couple of weeks ago to join us to do the most demanding routes in the area. So, with the bikes loaded with all the essentials we left Huaraz early one morning and headed to the little town of Carhuaz, the starting point of the circuit. The whole loop is about 300 kms if you start from Huaraz and about 230 kms if starting & ending in Carhuaz. 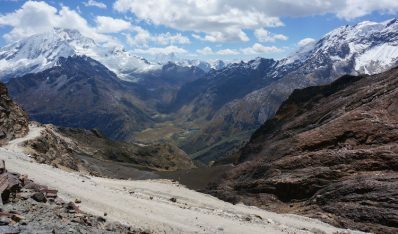 There are 3 passes over 4,000 mts (13,000 ft) to climb and many possibilities for hiking side trips along the way. It took us 6 days to complete the route including one rest day in Chacas and a side trip to the Lake 69 in the Llanganuco Valley. It’s important to go light and only carry the essentials. Although the grades are reasonable, half of the circuit is unpaved with some sections in bad condition, which makes progress slow and tedious. Being well acclimatised is paramount. You will be cycling well over 3,000 meters most of the time with long sections over 4,000 meters. 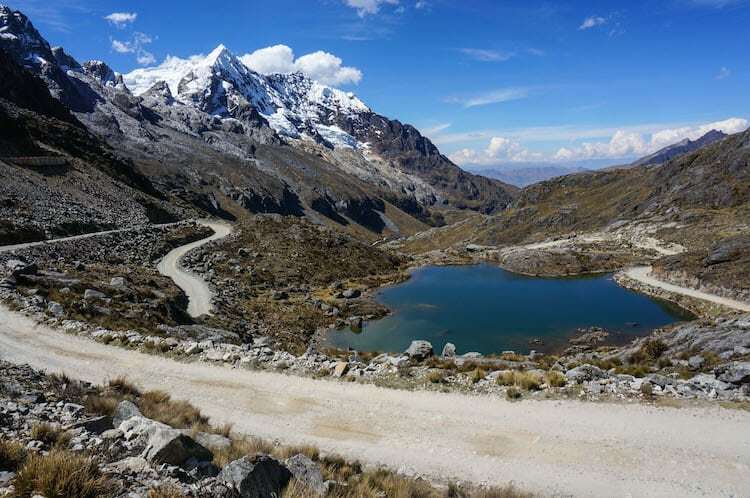 If arriving from sea level, allow enough days in Huaraz before attempting this route. If cycling the Huascaran Circuit anti-clock wise, the first pass to climb is Punta Olimpica. You will be enjoying a well paved road with very reasonable gradients. The last 18kms of switchbacks to the top are kind of a bicycle touring legend. 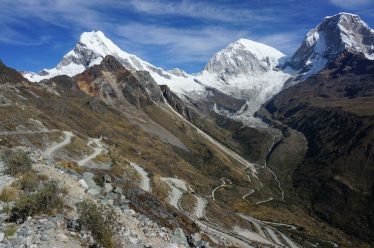 There are more than 30 switchbacks where you will be enjoying amazing views to the Ulta, Contrayerba and Huascaran peaks. In 2013 the highest tunnel in the world was built at 4,700 meters in Punta Olimpica. So, if you want to climb the real pass (all the way to the top) you will need to take the old bumpy road for the last 3 kms. Although it’s by far the toughest part of the whole climb, reaching the 4 meters wide hand-carved pass is a memorable experience. The descend on the other side is equally exciting. Once you pass the town of Chacas and after climbing a lower pass (Pupash at 4,070mts – 13,300ft) you will be ready to climb back over the Cordillera Blanca again. This time will be on a unpaved road and it will take you to the best viewpoint of the whole circuit: the fabulous Portachuelo de Llanganuco. This climb will test not only your strength but also your patience. The road has some sections that are in very bad condition and the big flies buzzing around your face will drive you mad. But once you reach the first laguna it will be a never-ending series of spectacular views over the Chopicalqui and Yanapacha. If that isn’t enough, the big reward is at the top. 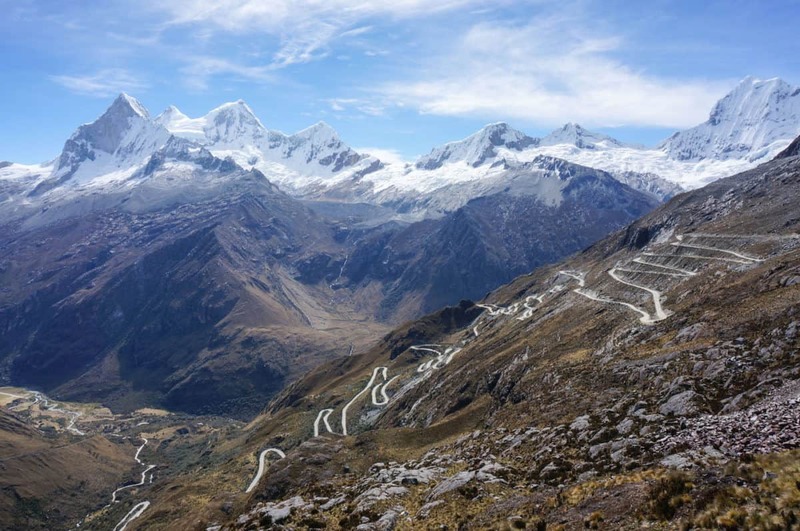 The 3-meter wide road cuts through the rock between the magnificent Huascaran and Huandoy with incredible views over the Llanganuco Valley. When you haven’t even had the time to take it all in, you just realize the unforgettable descend that awaits ahead. Clean, cheap and centrally located. The budget-friendly Alojamiento Soledad is probably one of the best values in Huaraz. The staff is super friendly and you feel like at home. Wi-fi connection is included. A great place to stay if you are traveling on a budget. Comfy beds, great views, professional service and excellent breakfast make the Guesthouse La Aurora one of the reader’s favorites in Huaraz. A perk is there are free hot beverages and a restaurant on site. The Andino Club Hotel boasts a lovely atmosphere, caring staff and large beautiful impeccable rooms. Located at a 10 minutes walking distance from town, it has some of the best views in Huaraz. A big breakfast with eggs made to order is served. 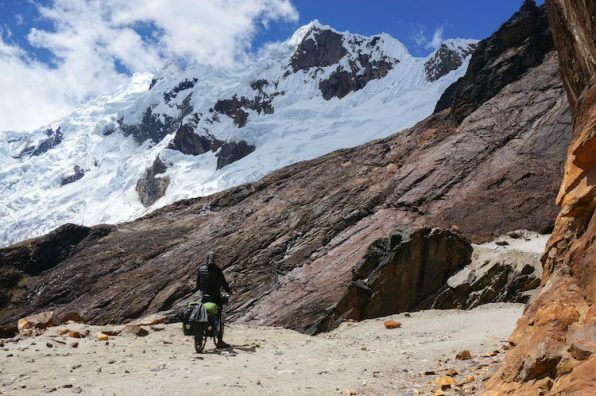 Cycling the Huascaran circuit anti-clock wise is a bit easier as you start with a paved climb to Punta Olimpica and ascend the Portachuelo from the Eastern side. 5-7 days depending on how fast you cycle and if you take days off to rest and/or explore some of the day treks available on route. 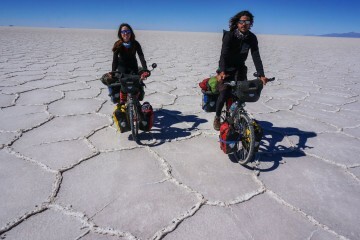 Dry season, from June to September, is the best season to cycle the Peruvian Andes. The skies are clear and there is less chance of rain. 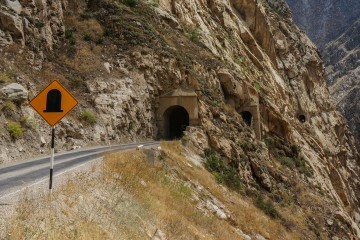 It’s recommended to go light on this route. Just take the essentials and leave everything else in Huaraz. Once in Yungay, if you don’t want to cycle on the main road back to Huaraz (60kms gently uphill), there are buses that can take you and your bike for 10 soles. 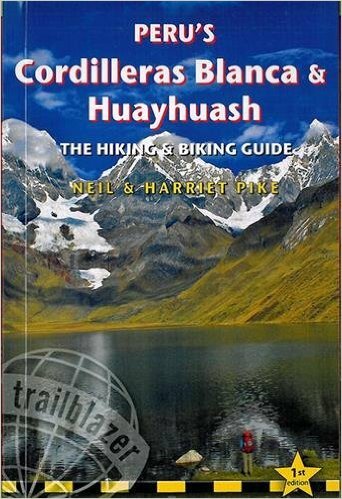 If you are looking for a guide to do the Huarascan Circuit and many other cycling and hiking routes around the Cordillera Blanca & Huayhuash, the new guide written by Neil & Harriet Pike is without a doubt the best up-to-date and most detailed resource on the market. It’s written by cyclists for cyclists. 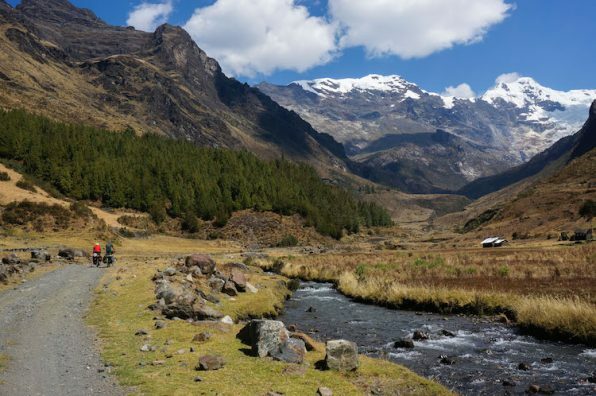 + Truly spectacular landscapes and views over the never-ending nevados. + The roads get very close to the snow-capped peaks. + The traffic is very light. – The road coming down from Portachuelo is in really bad condition. An unforgettable descend. – Lots of big flies once you pass the 4,000 mts (13,000 ft). 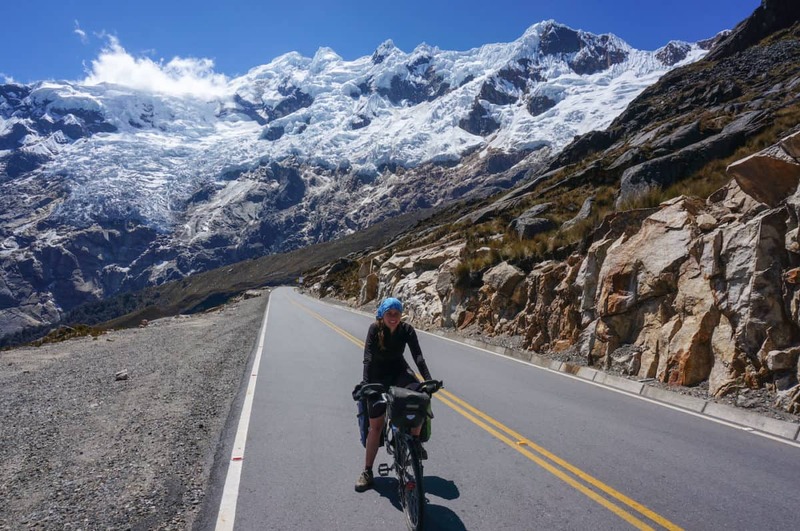 Cycling the Huascaran Circuit has been one of our best bicycle touring routes until date. Many cyclists consider this loop as one of the best in the world and we can see why. Impressive views await at every corner and there are not many roads that come this close to the snow-capped peaks. 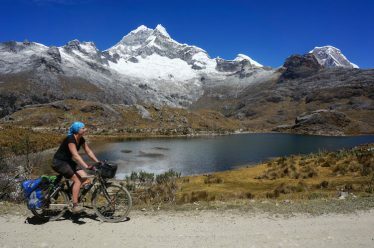 If you are cycling the Andes, the Huascaran Circuit on a bicycle is an absolute must. It’s also a challenging route. Three mountain passes over 4,000 meters (13,000 feet) need to be climbed and only one of them is paved. However, the reward you get to the top make you forget the tough climbs immediately. Location: Huascaran National Park, Ancash Region, Peru. 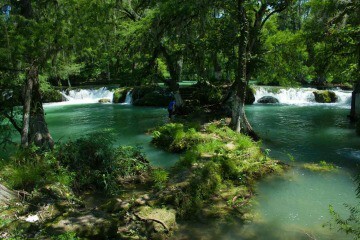 Price: You will need to purchase the National Park Permit (65 Nuevos Soles), valid for 21 days. Useful Notes: It’s recommended to cycle the circuit anti-clock wise, so you start with an easier and paved climb. 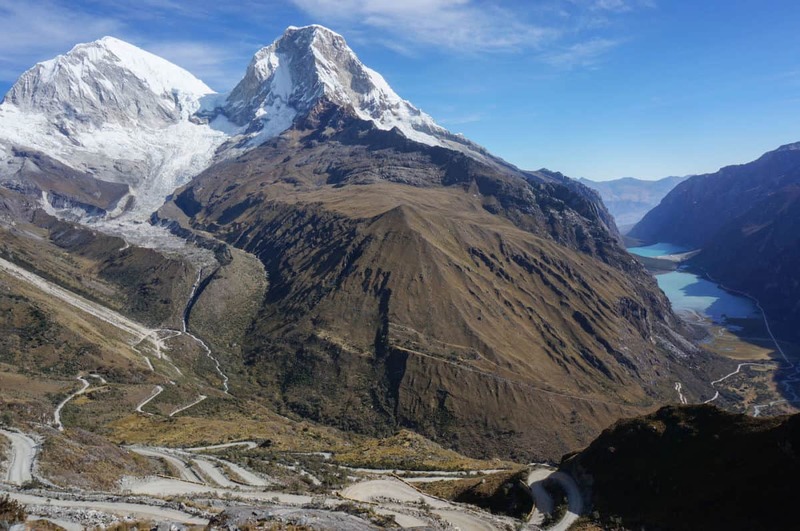 The fantastic guide Peru’s Cordillera Blanca & Huayhuash by Neil & Harriet Pike has all the information you need to do this route and many others in the area. Antonio is the co-founder of The Adventure Junkies. Addicted to adventure travel and unexpected plans. He's on a personal mission to help you get out there and do stuff. His favourite adventures have been cycling the Peruvian Andes, hiking through Fiordland in New Zealand, camping in Antarctica, diving with hammerheads and kayaking with Orcas in San Juan islands. He's been exploring the world full-time since 2013. 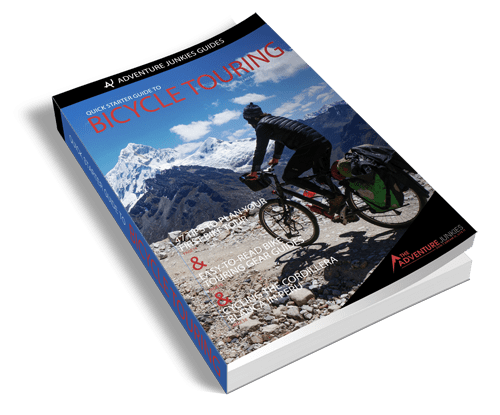 Enter your name and email to get instant access to the Quick Starter Guide to Bicycle Touring, which has been used by thousands of people to plan and prepare for their cycling adventures! Plus, you'll get exclusive content in our newsletter to help you hit the road faster! 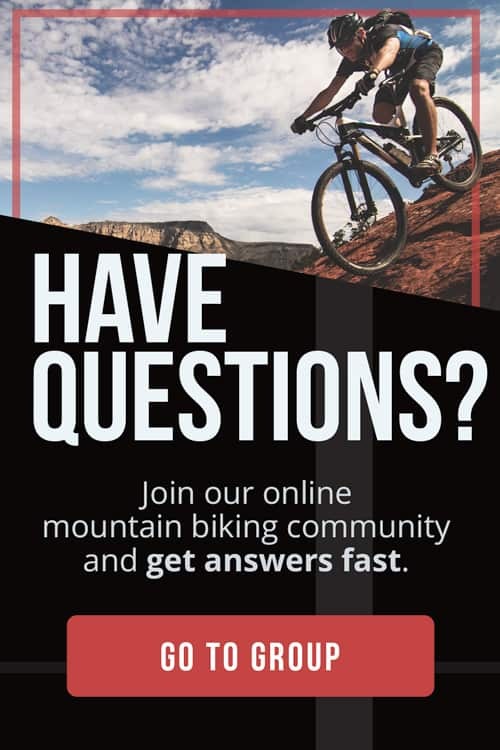 Along with the guide, you'll get exclusive content in our newsletter to help you make the most of your time on the saddle!